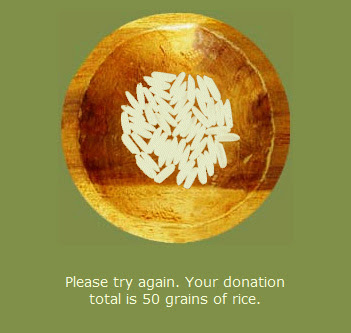 The rules are simple, for each word you get right, FreeRice donates 10 grains of rice through the United Nations to help end world hunger. To Save Lifes Press HERE!!! Please let all your friends (and enemies) about this game - Email this story to them. What a fantastic site! I wish I'd known about it when I was 'studying' for my GREs...it would have given me a lot more incentive to learn vocab. I'm sending a link to all my egghead pals.